If you are going to write a book, then you need the tools to do so. Better tools means that you’ll have a less stressful time getting your words recorded, but having the best tool doesn’t necessarily mean having so many bells and whistles that you spend all of your time learning how to use the tool rather than writing. 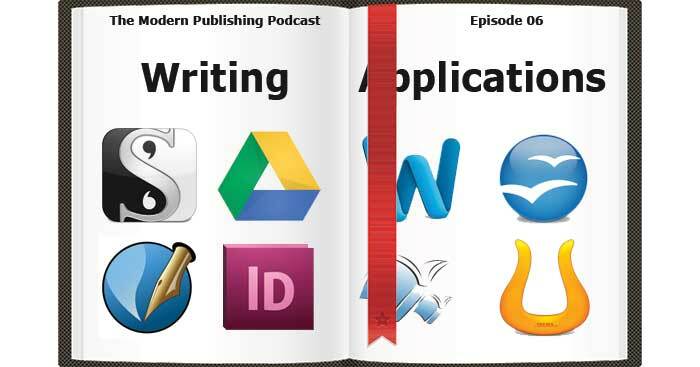 Welcome to Episode 6 of the Modern Publishing Podcast. My name is Blaine Moore. Now, when you’ve made your decision to write a book, what are you going to do to actually get your words recorded, and how are you going to put that book together. That can be a brain stumping question for some people, and there are really three different types of software that you can use. Well, technically there are more than that, but I’m going to cover three different ones today. Finding the right software for you might take a little bit of experimentation, but I’ll go over some of the best options in each category that you can take a look at and give a try and see what it is that you think that you might like. Now, the first category I want to talk about are just simple word processors, and this can be what everybody is probably used to in the business world, at least. If you’ve grown up with a computer in the last 20 years you’ve probably used Microsoft Word at some point in your experience. It’s an okay application. It’s great for writing a letter or doing a quick article or something like that, but it’s not that good for trying to write a book. Word files are not really meant to be that large. It’s a little clunky if you’re going to split it up for one file per chapter, although it will make it a lot easier for you to manage the book itself. There is a lot of stuff going on in the background a Word does that makes it so that you can keep the same kind of formatting and things like that available to you that really just adds a lot of junk to the files and makes them difficult to work with from whatever publisher you’re going with, even if that publisher happens to be you. So I wouldn’t necessarily recommend using Word, although it is certainly a viable option. If you want to use open source option that doesn’t cost anything and is very similar to Word, then you could consider using OpenOffice or LibreOffice. Now, technically, these are pretty much the same software. OpenOffice has been around for quite a few years, and LibreOffice is based off of the same code as OpenOffice, but a couple of years ago they split that code off and took the development in their own direction, and I found that the interface is a lot better at least since the last time I’ve used OpenOffice, and it tends to crash a lot less. So if you do want to use one of those, I find them a little bit more conducive to writing than with Microsoft Word. They tend not to crash as often as Word does, losing your work, but they do have a lot of the same limitations. They do put in extra things that you don’t really need. Even if it’s not as bad as with Microsoft Word, it does have better export functionality for going to, say, PDF format or HTML. The tools inside of LibreOffice and Microsoft Word are a little bit different. You’ll find that while there are some things like mail merge, they are not nearly as good in the LibreOffice and OpenOffice than what you would find in Microsoft Word. So if that’s something that you might need, then Microsoft might be a better way to go. If you do want to use a straight word processor, I would actually recommend a different alternative and that would be to use Google Docs. Google’s writing application doesn’t have as many features as Microsoft Word or OpenOffice or LibreOffice, but you don’t really need a lot of features for the actual writing of your book. If you’ve got your outline and you have your timeline for where you want everything to go, writing in Google Docs can actually be a lot less distracting, and it’s a lot less likely to crash on you, and if your browser does crash, then your work is a lot more likely to have been saved and you won’t lose anything. It also has versioning of your documents built right into the interface, so if you ever want to go back and see something that you changed, it’s very easy to see what your document looked like on at any given time, and those are features that aren’t really available with Word and the other options. So I know some people that use Google Docs for writing their books, and they do a very good job with that. They usually use that for the first drafts at least. So that’s a nice thing because your work also is in the cloud, so anywhere you’re working, you’ll find that you can pick up from a different machine and your work will be right there and you won’t have to worry about synchronizing your files between your desktop and your laptop or multiple laptops or your home and your work computers, whatever the case might be. The output that you’re going to get from Google Docs is going to be a lot better than Microsoft Word because it doesn’t have as much of the stuff in the background. Because it is a lot simpler, it doesn’t need to track it nearly as much as what Word and other straight-up word processing programs do so it can produce some cleaner files for you to work with in other applications when you’re getting ready to publish, so that might be a good option. There are also minimalist applications. Using something like even as simple as Notepad or TextEdit, if depending on whether you’re Windows or Mac. Those are free applications that come with your computer, and those don’t have any frills. It’s literally just a simple word processor, and that can be very popular from the crowd that tends to get distracted by all the bells and whistles and everything, and it’s a good way to just sit down and crank out the words, but again you’re going to be limited by whatever saving functionality, and you may want something a little bit more complex. There are some better alternatives if you want to go out and use a completely minimalist writing software, but I don’t have a lot of experience with those so I’m not going to recommend any specifically here. The next group of applications I’m going to talk about are publishing applications, and especially if you’re going to be publishing the book yourself, then you’ll eventually probably want to use one of these in order to create the actual files that are going to be printed. This includes applications like Microsoft Publisher, Adobe InDesign, and if you want something similar to InDesign but is free and open source, than Scribus has a lot of the same features. It’s not quite as rich as InDesign, but the price point is obviously a lot more affordable. Now, when you’re using these applications, they may not necessarily be the best for initially writing your book but they are the best for laying out the pages. If you’re using something like Microsoft Word, then your pages aren’t going to look very even. They’re going to be kind of splotchy, and that can be distracting for the reader. For example, if you’re using Justified text which you’ll probably want to for a print book because it does look a lot better most of the time, then the way that Word handles that is that it adds more or less space in between the words and spreads them out, and you can actually wind up with these gaps in the middle of paragraphs that just don’t look good, especially if you have a line that has a lot of really long words and they wind up getting split between multiple lines, then you have a lot of space that needs to be made up. If you’re using something like Adobe InDesign, it will automatically hyphenate all of your paragraphs which will even out the distribution of the ink. There won’t be these huge gaps, and your pages will wind up looking a lot better, and that’s much easier to control and something that allows you to lay out your pages more exactly such as Microsoft Publisher or Adobe InDesign. If you are going to go with that, I haven’t used Publisher for I don’t even know. It’s been probably a decade and a half or two decades since I’ve used that, so I imagined that’s come quite a ways, although Adobe InDesign and Scribus which is the open source alternative that you might want to look, those are a little bit difficult to learn how to use, but once you have, it’s very well worth it and makes it much better for laying out your books. The next group of software that I wanted to talk about are the writing environments, and this is probably where I would recommend people to take a look. My favorite software happens to belong to this group, and let me explain a little bit about what a writing environment is. A writing environment is something that’s there for book writing or for any kind of writing that’s more complex than a simple article, but it’s not like your general word processor that’s there so that you can make a pretty letter to a friend or something like that. It’s kind of a mix between the laying things out and having all of your information together and being able to actually sit down and write in there. Now, my favorite writing environment that I use is called Scrivener. I use Scrivener for Mac which is where it was initially developed for, and they do have a Windows edition. It’s not quite as fully featured, although now that it’s been out for a few years, the Windows version is actually quite good. The features usually will show up in the Mac version first, and then eventually make their way to Windows, so if you are on a PC, then you’re in a pretty good shape with the PC version now. The two versions of software, the files they create aren’t compatible back and forth, so you will have to stick with either the Mac or the PC version if you’re collaborating with anybody. That is one of the disadvantages of using something like Scrivener is that it doesn’t have the collaborative features that you’d find in something like Google Docs which allows two people to edit the same files at the same time. But the advantages that it has far make up for it. The way Scrivener is laid out is you can use it very simply as a barebones word processor without having a huge learning curve, but once you do take a little time to learn the software or as you get into more complex projects and learn the software as you go along, it has a lot of features that make it much easier to work such as you can have a resources area of your book where you would click on and you could have audio files, images, just random notes, URLs, videos. You can put pretty much anything you want into this resources section, and then anytime that you need to look up some research, you can have that in a separate pane right next to what you’re working on so you can be looking at a picture. Now, this may not be something that’s going to actually be in the book, but you can sit there and use it as a reference. One of the ways that I’ve used it in the past is to have an audio file of a talk that I’ve done with some colleagues, and then just going over and have that playing while I was writing and then I was pretty much writing about what we were talking about, so I had that information right there and handy and I could easily pause and go back without leaving the application or having it in another screen. Now, it also makes it very easy for you to be able to go in and outline and separate all of the different sections and rearrange things, so if you are taking your outline and putting it into Scrivener, you would be able to put your different parts of the book. So if you had Part 1, Part 2, Part 3, and then you had chapters within there, Chapter 1, Chapter 2, Chapter 3 and Part 1, Chapter 4, 5 and 6 and Part 2, et cetera. As you’re going in and outlining, you can actually switch the views that you’re looking at, so instead of just looking at a straight-up view of your entire manuscript, you can easily jump to one specific place. You can jump to different parts of each chapter, and you can even convert each of those individual parts into index cards and rearrange them to what makes the most sense because what you had in your outline may not actually make the most sense and be the best narrative that you want to follow while you’re presenting that information to the reader, and once you have things written, it’s a lot easier for you to decide what makes a bit more sense in how you’re going to organize and it makes it very simple to just reorganize and move everything together. One of the most powerful pieces of Scrivener is, after the fact, you can easily compile your entire manuscript into different formats. So for example, if you’re going to be publishing it yourself, you could compile it into a relatively clean Microsoft Word version or into a EPUB version for digital or into an HTML version or into PDF, however you want, and you can have individual versions that get compiled for different marketplaces. So if you have an EPUB version that you send out to one marketplace such as Kobo or Barnes & Nobles’ Nook, then you can have another one for Smashwords because they have different requirements such as having to have Smashwords on the copyright and title page saying that this is the Smashwords’ edition. Well, it’s very easy to set that up in Scrivener and with a couple of clicks of a button you can have that automatically generated without having to remember to update individual files after you’ve created them. Now, I don’t know if I’ve done the best job of explaining Scrivener. I might have been jumping around a lot, but I just like it the most because it makes it very easy for me to organize my thoughts and makes it very easy for me to have my research right there while I’m working, and there’s a lot of other tools I haven’t mentioned such as being able to track your word counts or to make notes that aren’t going to go into the final document that you can then use for later reference or as reminders or as notes to collaborators if you’re passing the files back and forth. One of the useful aspects of the software is that you don’t have to actually save your files as you go along. It automatically saves in the background every couple of seconds as you type. It’s very fast. It’s a lot faster than something such as Microsoft Word if you need to jump to a different part of the application. Word can take forever to sit there and scroll or to try and search. Whereas in Scrivener, it’s nearly instantaneous. It’s very easy to make backups so that you can take different drafts of your stories so if you have a first draft, you can back that up very simply as the first draft and then go in and do your second draft, back it up, do your third draft, back it up, and then you can actually make comparisons between each individual drafts so you can see exactly what changed in any small piece of your book. You can see what changes were made and how they were made, when they were made and compare them. Some of the other writing environments that might be worth taking a look at, and I’m not sure whether there are Windows equivalents. I know these next three all work on Macs. I don’t think that any of them have Windows versions, but I’ve heard really good things about them and they are similar to Scrivener in that they’re writing environments and they have a lot of features. They tend to be relatively minimal environments for writing if that’s what you want so that you don’t have to worry about bells and whistles and formatting, but they do encourage you to get your story down, get your book down without a lot of distractions while still giving you access to tools that will help you to write your book. Those tools are Ulysses III, Storyist, and StoryMill. I can’t really get into a lot of specifics. I personally haven’t used the three of those, but when looking around and talking to other people that have written books, those are the three that come up the most often after Scrivener from what I’ve noticed, and Ulysses III especially I’ve heard a lot of good things about that make it worth taking a look at if Scrivener isn’t quite your thing. So for me personally, if I’m going to be writing, then I like to use Scrivener as my first go-to application especially on a new book, and after that, I tend to try to stick to something like Google Docs where things are easy to backup and live in the cloud, and I don’t have to worry about the application crashing. So I hope that this has been helpful and there is other software out there that you can use along with these particular applications such as something to help you if you’re writing a novel, keep track of timelines and characters, things of that sort. I’m not going to get too much into those other than what appears inside the writing environment software that I did mention. Those are their own sort of types of applications that you don’t necessarily need just to write the book, but generally speaking, as I said, I’ll go with Scrivener first for the writing. I would use Google Docs if it’s a shorter piece or if Scrivener isn’t going to be a good option due to collaboration or whatever the case might be. Those are my go-to for writing, and then for publishing, Adobe InDesign or Scribus are probably the two that I would recommend taking a look at first. This has been another episode of the Modern Publishing Podcast. I hope that you found it useful. I hope everyone has a good holiday next week here in the US, it will be Thanksgiving, and I do plan on publishing a new episode so I’m looking forward to talking to you next week, and I hope that you’ve had some good ideas for your books, and hopefully the software you heard about today will help you get that book down and get it actually written. See you next week.